Browsing Ebay, the other day, I came across a GG1. It appears that it is two rail and scale, of course. The starting price is $4899.00. But you can have it now for $6500.00 + $165.00 shipping. Brand New Condition. New in Box, never removed. Absolutely stunning model. The Pennsylvania GG-1 locomotive is the second of the Kohs series of class American locomotives of the 20th century. This type of drive incorporates 6 pairs (12 total) of Swiss made core-less motors positioned as the traction motors were in the original prototype, rather than the twin Pittman motors used in the standard version. George Kohs brought these models in about the 2005 -2008 I believe. About the same time Lionel came out with there JLC GG1 in 3 rail. Very surprising that the models look identical with the exception of the pans. I have a total of 19 GG1's ,the 6 JLC G's were 2 railed for me by Joe F.
When I place it next to my Kohs version , most people think the JLC is a Kohs !!! The only difference between men and boys is the price of our toys !!! "...be a kid.... 5 & 1/2 years old....... The more I know, the more I know how little I know.."
I think what was impressive, to me, was the description of the drive train. The mention of six pairs of "Traction" motors. 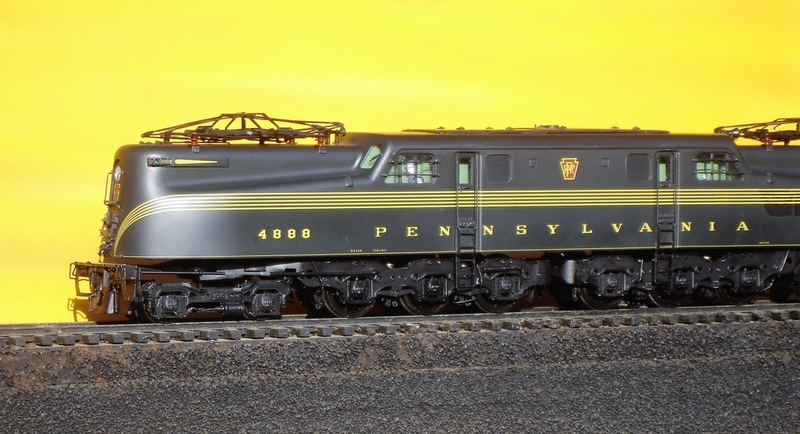 "The Pennsylvania GG-1 locomotive is the second of the Kohs series of class American locomotives of the 20th century. This type of drive incorporates 6 pairs (12 total) of Swiss made core-less motors positioned as the traction motors were in the original prototype, rather than the twin Pittman motors used in the standard version." In the list below the two descriptive paragraphs, it mentions two Pittman motors. This must be the features of the original release. Impressive, but my MTH GG-1s will have to suffice for me. There is no argument that the Kohs models are magnificent museum quality. I am glad that there are folks who can afford them. Without those people Kohs would not be producing them. I personally enjoy reading about them and on occasion getting a chance to see them. They may be out of many of our reach. But because of Kohs, I believe other importers and manufactures up their detail and bring us even better models. In the meantime I keep buying lottery tickets . You never know there may be a Kohs model in my future! I'd like to hear from those that operate Kos GG1's on their railroad. As a runner how well does it perform compared with less highly detailed models. I've owned (and sold) two Kohs PRR K4s and found them to be less desirable than other K4s O scale models from an operating perspective. As "display case" models they were exceptional. Their clever moving parts like turret and sand hatches, tender water leg and coal bunker doors made handling for routine maintenance at times difficult. More than an inconvenience was that the K4s's were underpowered and prone to shorts due to moving brake gear on the tender trucks. Not all Kohs locomotives are hanger queens as I've seen Chris Smith's Y6's running beautifully on his railroad. Just asking - John what has been your experience running the Kohs GG1? PS - The Kohs K4s' have a second motor in the boiler to power the operating reverse gear mechanism. I have a full page of describing how to remove the boiler. The task is daunting due to the hidden linkage between the reverse gear motor and the valve gear. My preference would be eliminate the reverse gear motor in favor of a larger lead weight for more tractive effort . Does the eBay seller have both version descriptions blended together? First it mentions have 12 Swiss motors instead of 2 Pittman motors (above). But then below it lists 2 Pittman motors, not the 12 Swiss ones. Or am I reading the listing incorrectly? I believe you are reading it correctly. The seller does not make it clear which version he has for sale. Rob M. ARHS # 3846 PRRT&HS # 8141 EPTC "Life Is Like A Mountain Railway, With An Engineer That's Brave..."
Forget the fact that it's a Kohs model! I'm more impressed that JDunn has 19 GG1's! That's pretty awesome in itself! Engines of any sort, steam, diesel or electric are just fascinating pieces of equipment. Glad it wasn’t just me. I finally found the auction and I see al sorts of red flags. The seller hasn’t been on eBay that long, and although he says it’s still sealed in the box, he didn’t even post a picture of the box. The only picture is off the Kohs website. I’ll still keep watching the auction to see if anyone else goes for it. "One piece no seam body". Does than mean the body is hydro formed over a plug or mold? Eternity is a long time to have been wrong. To clarify the drive issue, my G has the 2 Pittman motors as a drive which Kohs installed in the first 140 units. The last 10 units were called the "Collector Series" and utilized the more prototype quill drive and the accompanying 12 Swiss motors drive system. According to the Kohs brochure in my GG1 box the price was $2,800. for the 140 units and $4,000 for the 10 Collector Series units. Conrailfan- I grew up in the Tacony section of Philadelphia and also went to St.Leo's grade school across from the main line. My love affair with the G goes back to 5 or 6 years old- I am now 62. 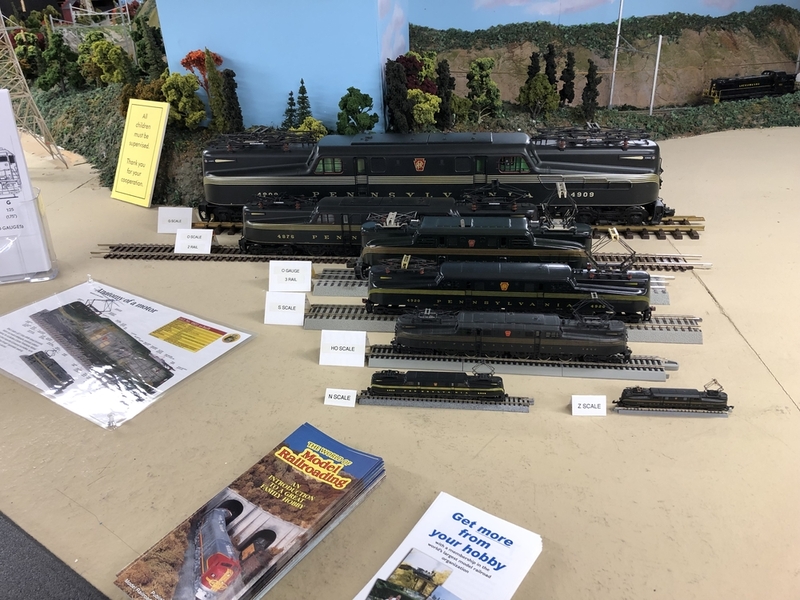 For the past 2 years I have presented a display of GG1's at our Cherry Valley 2 Rail O scale Holiday open houses to show the different scales - Z to G. - to the public and even though the GG1 has been gone for 36 years, the display has triggered a lot of memories from our visitors. I do not feel I have enough G's as the Pennsy had 139 of them !!! 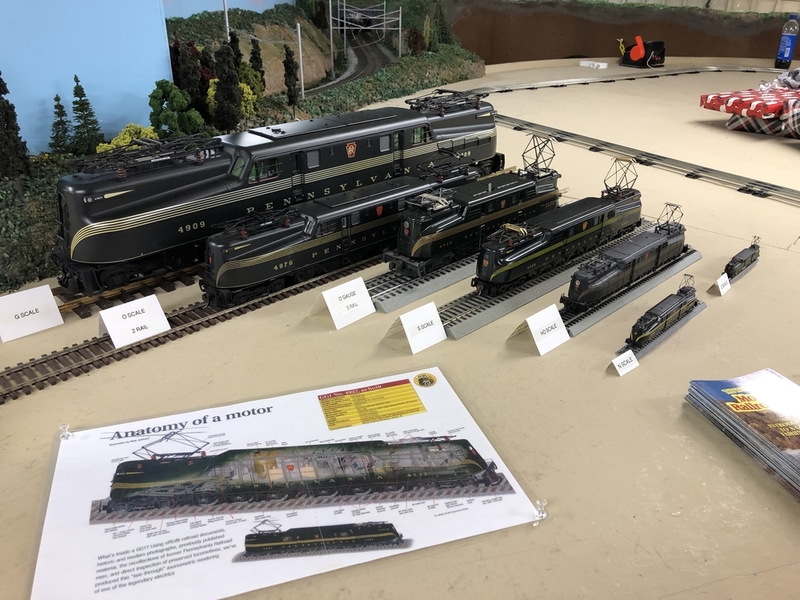 I have included a photo of the display of GG1's in different scales. and I dare not put DCC in either pieces. Alas, they will be very expensive shelf queens in my PRR room. Great topic anytime to talk about my favorite locomotive -the GG1. Look at this guys feedback. Not a lot of sales, but a lot of unhappy customers. I once owned two of these and am delighted to say I got rid of BOTH of them. Almost every wheel set on both were gauged incorrectly resulting in numerous derailments. When I asked the importer about this glaring defect I was told: “That’s the way the prototype was”. The importer refused to correct it. On a happier note, over time I eventually found two of Bill Wolfer’s contributions and now have a green and a red one. A serious GG-1 enthusiast I know swears that the compound body curves on the Wolfer are more correct than the other, draw your own conclusions. The Wolfer with much less detail still captures the grandeur of the prototype just as well as the other, runs like the wind and has yet to derail. Did not know Bill made bodies, but those truck castings are works of art. I have three sets. I can appreciate how a collection can grow - I think I have six, all doorstops. Five are bronze castings, one is aluminum. I treat them like auto bodies, attempting to get a glass finish prior to decaling. The Kohs looks remarkably like one of my JLC versions. I have always preferred the Tuscan to the Brunswick, but also preferred the 5-stripe to the single. My issue is that it seems that only the single had the large keystone which I find to be so striking. As for the price... and people thought the Vision Line GG1 was pricey??? Most of us are in need of an intervention. Perhaps he did not, I assumed he did but may be wrong. My friend, a mechanical engineer, made the compound curves comment. There may be scanning programs capable of comparing both models to the prototype, would make for some interesting reading. Paul mentions the keystone size on later GG1s. This brings back my college years. We were in a class known as The History of Architecture. Professor John Clauser was fascinating to listen to. We learned how societies art and architecture evolved as each civilization progressed. For example, Ancient Greece, the cradle of Democracy started as an idealistic people. Their thinking was clear and their art and architecture expressed this idealistic mindset. As time went on and Greeks became more powerful and affluent, so did their expression in art and architecture become more ornate. There are three main periods in the Greek civilization. Thus three periods where architecture, for one can be expressed. The Doric or beginning period of Greek culture. Architecture was expressed in it's pure sense. Not ornate but rather strong with idealistic yet simple lines. The middle period known as the Ionic period, when Greece was finding it's plan in the ancient world. Architecture became more ornate, but still expressed purity. Finally the Corinthian period. This era was the final part of the Greek civilization. Greek society became decadent. Art and architecture reflected this. The reason behind the overly ornate architecture was that as a society, Greece was loosing it's power through greed and corruption. The clear thinking that had prevailed was lost. So in order to make themselves appear powerful and respectable, architecture became overly ornate. Ancient Rome thought very highly of Greece and copied much of their accomplishments in government and art. But Rome fell into the same trap and their architecture reflected the downward spiral of society, just as the Greeks before them. This brings us to the Pennsylvania Railroad, among others. The docketing of the GG1 is a fine example of Doric, Ionic and Corinthian periods. Originally, the GG1 was adorned with elegant yet understated striping and small keystones. The lettering was simple and straight forward. It can be said that the Ionic period for the railroad was skipped. In the post-war period, about the early sixties, when the railroad was in decline, the decoration of the GG1s became bold and overdone with a wide bright stripe and large keystones. It can be said that this was the railroads way of letting itself be known as it's influence in transportation declined. We, in this hobby don't really care that the GG1 went through different paint schemes. In fact, we relish being able to have each or as many as we can afford on our model railroads. Thanks for the fascinating historical perspective, Dan... I think!!! Sombody's got to do it. "Still trying to not shoot my eye out"
"Nursing insomnia one railcar at a time"
My aroma therapy? Smoke Pellets. (JDUNN) John- Those are absolutely stunning! I really do like the G scale one, it really stands out as a model. Beautiful piece though my budget permitted the K-Line Collector's Club model. And anybody who missed the Kohs, Legacy, or Wolfer GG1s should pay attention to the Sunset/Third Rail models. Their only flaw was power to only four axles, but that is easily remedied with some Delrin chain and sprockets. Nice looking Baldwin shark Bob. Whose model is it? I am John Galt ! Penn-Erie cast aluminum - See upcoming articles in OST. There are also a couple of people listing Lionel Smithsonian sets for too much money. One was listed for several months @$7200 and is now $6500. Still at least $1K too much. And now another set for even more money. They will sit and sit. The Kohs GG1s should be in the $2500 range. 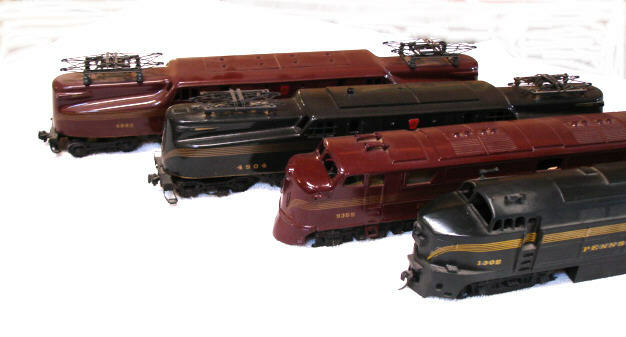 I'm kinda partial to the GG1's also. I grew up in Bristol and Levittown Pa. Always seen them running from Morrisville to Philly. Stood along the tracks in Edgely to watched the Kennedy funeral train. I collected two complete sets of all twelve different GG1's that AHM Rivarossi put out. Glad this didn't die. I have noticed that when I post a photo, a thread often immediately croaks. I too lived along the PRR for a few years in the 1950s, in Berwyn and Rosemont. I rode the MP54s for a good six months twice daily to 30th Street station. I also saw PRR steam - once a light run on the Trenton Cutoff - either a Mike or Dec - went by so fast it caught me by surprise - and once out of Penn Station in a coach behind a K4, going to Ocean City. That was really a surprise! 1956. I also lived, and still do, along the PRR main line in NJ. Spent most of my youth watching GG1's pulling fast passenger trains and 100 car freights. Double headed G's were a common sight on the freights and thrilling to see. Can a Slip Switch Be Made to Work On a Layout? Video how they work. Spicing Up our Boxcar Fleets, Or What's Out There? TrainWorld Brings York To You! New Video On TrainWorldTV York Spring ETCA Train Show Episode! Weekend tinplate photos 📸 & video 📽 4/20/19!